The Special Olympics Young Athletes program is an early Special Olympics program for children ages 2-7 with and without intellectual and physical disabilities. This program meets on Saturdays, and volunteers typically accrue 10-12 hours of service over the course of a season/semester. 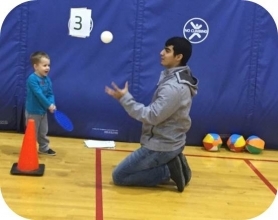 This program fosters gross motor skills development, as well as cognitive and social skills development through participation in age-appropriate and fun activities. Volunteers work one-on-one or in small groups with children and their families, rotating through activity stations. Interested volunteers need to fill out a YMCA Volunteer Application and a Special Olympics Volunteer Registration form and submit both forms to the Y (105 NE Spring St. or volunteer@palouseymca.org). Volunteers cannot participate until all paperwork is submitted to the YMCA. These forms can be found in the resources section below. Volunteers are required to commit to a whole season. For any questions, email volunteer@palouseymca.org or call the Y at (509) 332-3524.